Today's Nature has a significant article that I'd like to draw your attention to, but before I do I've got a complaint to make. One of the letters in today's Nature (Seeber, 2008) addresses the question of citations in online Supplementary Information. I've moaned before about the problems with online Supplementary Information for papers - most notably the issue of it becoming unavailable over time - and Seeber's letter gives me one more reason to dislike SI. Apparently, the various sources of citation rankings such as impact factors don't include citations that only appear in Supplementary Info. What really gets my goat, though, is that the editor of Nature states in a replying note that, "Supplementary information for Nature... does not usually contain references". This is simply not true. The Supplementary Information for the paper I'm about to write on has a bibliography of 53 references. Saarela et al. (2007) included 13 supplementary references, as did Xu et al. (2007). Brandt et al. (2007) had 62. The SI for Bininda-Emonds et al. (2007) has 75 references. In fact, I haven't often seen a Supplementary Information file that hasn't included extra references, so if Nature has a policy of discouraging supplementary references, they're not doing a very good job of enforcing it. After years of ignorance, we are slowly piecing together an understanding of the inter-relationships between the various groups of eukaryotes. In the process of doing so, researchers have confirmed some traditionally recognised groups, dismantled others, and recognised new groupings that were previously unsuspected. One well-supported group of protists that has emerged into the light is the Alveolata. Alveolates combine three superficially dissimilar groups - the ciliates, dinoflagellates and sporozoans - united by the possession of alveoli, flattened membrane-bound vesicles directly under the cell surface, supported by microtubules. Within the alveolates, it is also generally agreed that the dinoflagellates and sporozoans are more closely related to each other than to the ciliates. The sporozoans are parasitic forms that include a number of significant pathogens such as Plasmodium, the cause of malaria, and Cryptosporidium. One of the interesting, relatively recent discoveries about this group of organisms was that some of them possess a remnant, colourless plastid (referred to as the apicoplast), which together with the presence of chloroplasts in the related dinoflagellates suggested a photosynthetic ancestor. Understanding the origin of apicoplasts has become particularly significant as it has been touted as a potential target in developing treatments for sporozoan infections that target the parasite without damaging the host. Unfortunately, a direct connection between the apicoplast and the dinoflagellate chloroplast has remained largely theoretical. Not all sporozoans possess apicoplasts - only a particular clade (including coccidians and Plasmodium) does so, while other sporozoans such as gregarines and Cryptosporidium show no sign of them. Chloroplasts or chloroplast remnants are also absent in an assortment of alveolate flagellate taxa (such as Colpodella) that are regarded as falling within the dinoflagellate-sporozoan clade. 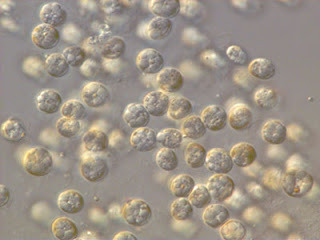 Direct comparison of apicoplasts and dinoflagellate chloroplasts is pretty much impossible - apicoplasts have (unsurprisingly) lost all photosynthetic genes, while dinoflagellate chloroplasts have developed severe wierdnesses of their own where they have pretty much lost all genes except the photosynthetic ones*. As a result, researchers have been unable to entirely rule out the possible that sporozoans gained their plastids independently from dinoflagellates. This is where today's announced discovery comes in. *And severely altered what little they have left. In fact, dinoflagellate genomes as a whole are wierd beyond all belief - they're the only eukaryotes to have lost histones, for instance. I have no idea why they're so strange. Chromera velia is a small photosynthetic eukaryote, shown above in a photo from the News and Views section of Nature. It is generally immotile, though an internal(!) cilium is present at one end of the cell, and motile stages were seen briefly in old cultures. Reproduction was mainly by binary division - frustratingly, Moore et al. add "not restricted to binary division", but completely fail to explain what this means and how sexual reproduction occurred (if it occurred). In fact, the paper as a whole is frustratingly uninformative about the ultrastructure of Chromera*, being mostly dedicated to the molecular phylogeny of the new taxon relative to other alveolates. *I mean, seriously, how can you refer to an internal cilium and not go further? The molecular phylogeny quite strongly supports Chromera as more closely related to sporozoans than dinoflagellates, though less closely related to sporozoans than are colpodellids. The discovery of this photosynthetic member of the sporozoan line adds additional support to the idea that sporozoans are ancestrally photosynthetic. However, this does not automatically mean that dinoflagellate and sporozoan plastids share a single origin, despite the authors' conclusions. Analysis of plastid genes gave conflicting results - psbA supported a dinoflagellate-Chromera grouping, but SSU rDNA did not. Alveolates have also been suggested to be closely related to the chromists, another group of mostly photosynthetic eukaryotes (including brown and golden algae and diatoms), in a larger grouping called 'chromalveolates'. The existence of the chromalveolate clade was first suggested by their mutual possession of chlorophyll c, a form of chlorophyll not found in any other organisms*. However, Chromera lacks chlorophyll c, and possesses chlorophyll a only, like the red algae from which chromalveolate plastids are derived. *For those unfamiliar with the various chlorophylls, chlorophyll a is the ancestral form found in pretty much all chlorophyll-containing organisms. Chlorophyll b is found in green algae, land plants and organisms with green alga-derived plasmids, as well as a few Cyanobacteria. Chlorophyll c, as I've said, is found in chromists and dinoflagellates. The authors of Chromera assume that this indicates a loss of chlorophyll c in the ancestor of Chromera, but I would say that this is too strong a conclusion. The possibility that the sporozoan + Chromera ancestor gained its chloroplast independently from the dinoflagellate ancestor remains alive and well, and, as always, we need to look further into this question. Bininda-Emonds, O. R. P., M. Cardillo, K. E. Jones, R. D. E. MacPhee, R. M. D. Beck, R. Grenyer, S. A. Price, R. A. Vos, J. L. Gittleman & A. Purvis. 2007. The delayed rise of present-day mammals. Nature 446: 507-512 (SI here). Brandt, A., A. J. Gooday, S. N. Brandão, S. Brix, W. Brökeland, T. Cedhagen, M. Choudhury, N. Cornelius, B. Danis, I. De Mesel, R. J. Diaz, D. C. Gillan, B. Ebbe, J. A. Howe, D. Janussen, S. Kaiser, K. Linse, M. Malyutina, J. Pawlowski, M. Raupach & A. Vanreusel. 2007. First insights into the biodiversity and biogeography of the Southern Ocean deep sea. Nature 447: 307-311 (SI here). Saarela, J. M., H. S. Rai, J. A. Doyle, P. K. Endress, S. Mathews, A. D. Marchant, B. G. Briggs & S. W. Graham. 2007. Hydatellaceae identified as a new branch near the base of the angiosperm phylogenetic tree. Nature 446: 312-315 (SI here). Seeber, F. 2008. Correspondence: Citations in supplementary information are invisible. Nature 451 (7181): 887. Xu, X., Q. Tan, J. Wang, X. Zhao & L. Tan. 2007. A gigantic bird-like dinosaur from the Late Cretaceous of China. Nature 447: 844-847 (SI here). Now can someone go and find a similar thing for ciliates?